Reallusion extends CrazyTalk Animator’s usefulness into everyone’s daily life. CrazyTalk Animator 2 is a fully-featured animation tool designed for storytelling, and for presenters to quickly add animated avatars and comic effects into PowerPoint, Keynote, Google Doc and other presentation software. With its full editing capabilities, well categorized content libraries, and no monthly fees, users can easily design unique characters and specific motions to later copy-and-paste to most web and office applications. Users can now quickly turn boring presentations into show-stopping, animated demos with captivating openings, persuasive pitches and interactive storytelling that could present all by themselves. 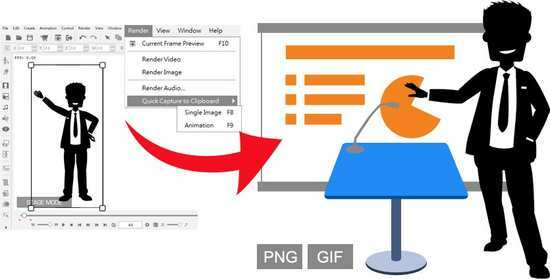 See how to make an effective presentation with comic avatar. It’s not surprising that presenters are now looking towards new ways of captivating and engaging audiences, and this has never been easier to do than with animated avatars which provide a means of effective communication in 4 very important areas. Emotional Appeal: where presenters engage audiences with visuals instead of text, making things much more fun to watch. Power of Storytelling: where we set the mood and empathetically guide our audiences into seeing things from our perspective. Memorable Identity: what we do when dropping visual cues and recognizable avatars to create association. Relaxed Interaction: when we break down mental barriers prior to having audiences endorse our ideas. With an explosion of online explainer videos, its not a mystery why marketing agencies, boardrooms and businesses are now looking towards easy-to-use applications that require little to no artistic skills or experience. This has brought a surge of online services that offer quick but limited content and rights. These services can also be pretty pricey even when you are not using them every month, not to mention their incompatibly with everyday tools like PowerPoint, Keynote, Evernote and others. This is where CrazyTalk Animator 2 comes in, as it gives you all the ease and speed in animated production, while providing unlimited customization options, 100% royalty free content and absolutely no hidden or monthly fees. 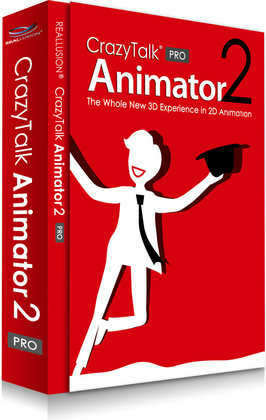 What is CrazyTalk Animator 2? CrazyTalk Animator 2 is a revolutionary animation suite with all the necessary tools to easily create highly customized animations without any background experience. CrazyTalk Animator 2 provides an exciting new approach to traditional 2D animation with innovative tools that allow users to easily customize comics, photo-face avatars, and facial lip-syncing. Users can also apply 3D motions to 2D characters, while opening new possibilities for freely editing 2D motions and viewing them from any angle with a single click. Combined with functional features like facial puppet and body motion key editing, it has become the most creative software for 2D character animation and quick capture export for use with 3rd party presentation tools.